Sylvia Plath, The Bell Jar. Faber: 1963. Sylvia Plath was born in Boston in 1932, which made her 31 when her only novel was published, shortly before her suicide. According to Ted Hughes she began writing it in 1961. As a consequence of the similarities between the story of her protagonist, Esther Greenwood, and her own, it’s tempting to see it as at least semi-autobiographical. Let’s avoid that temptation. This novel has been so widely written about – it’s often featured on the syllabus of schools and universities, and is seen as a seminal work of feminist fiction – that I shan’t give a detailed plot summary. Instead I’ll pick out a few points that interested and pleased me. It was a queer, sultry summer, the summer they electrocuted the Rosenbergs, and I didn’t know what I was doing in New York. I’m stupid about executions. That impersonal structure – ‘they electrocuted’ -shows her sense of detachment from the events, however; she doesn’t share the paranoia, it registers less strongly, as the structure of that opening sentence reveals, than her personal sense of dislocation. This is a compelling, often terrifying narrative of an intelligent, diligently academic young woman’s decline into a depression that almost destroys her. I collected men with interesting names. I already knew a Socrates. He was tall and ugly and intellectual and the son of some big Greek movie producer in Hollywood, but also a Catholic, which ruined it for both of us. But this faux-naïve style is essential for the establishment of Esther as a 19-year-old trying to locate her identity and place herself meaningfully in the heedless world she’s discovering for the first time. She flirts with all kinds of personae, even considering becoming a nun at one point. Women-haters were like gods; invulnerable and chock-full of power. They descended, and then they disappeared. You could never catch one. This might sound ‘girlish’, but it’s perceptive and, in a sense that still resonates today, realistic. Although it maybe shows an aspect of Esther’s dwindling self-esteem, it’s also redolent of her core values. The Marcos of this world, she realises, are the same ‘they’ who executed the Rosenbergs. In the first part of the novel we witness the cause of Esther’s problem: she doesn’t know why she’s there in the city in the coveted role as intern at a women’s fashion magazine that has pretensions of literariness. Though she can’t quite articulate it in this part of the narrative, she hates the shallow pointlessness of the work she’s obliged to engage in and the people she works with. Her ambition to write serious literature is stifled so effectively by those around her, including her mother, so ambitious (like everyone else) to mould her daughter into the Stepford Wife form she considers desirable, to realise she’s missing the signs of Esther’s distress, that she simply switches off her consciousness, loses agency. Eventually she comes to feel she’s suffocating under a bell jar, like a scientist’s specimen, and attempts suicide. Esther avoids the company of the ‘Pollyanna’ faction in the girls’ hostel she lives in during the novel’s first section; she longs to be a rebel like her friend Doreen. But she also realises that Doreen’s idea of a good time ends with her serving as a drink-sedated groupie for a sleazy DJ. All of her female contemporaries are happily speeding into spirit-destroying patriarchal dead ends. There seems no route open for someone with her gifts and sensibility. I thought the most beautiful thing in the world must be shadow, the million moving shapes and cul-de-sacs of shadow. There was shadow in bureau drawers and closets and suitcases, and shadow under houses and trees and stones, and shadow at the back of people’s eyes and smiles, and shadow, miles and miles and miles of it, on the night side of the earth. 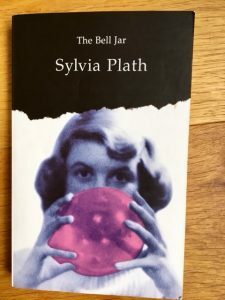 This entry was posted in American Literature and tagged Feminist fiction, Sylvia Plath, The Bell Jar, The Rosenberg executions, TS Eliot by Simon Lavery. Bookmark the permalink. Wow. What a powerful essay, Simon. Clearly, there is literally no “place” for Esther Greenwood in the world she finds herself in. So sad that the road to madness seems preordained for her. This reminds me a bit of some perceptive recent comments I read on the character of Kurtz in the film “Apocalypse Now.” The suggestion that madness may have been the only “rational” response to some situations. In a related vein, there is an incredible series of essays by Estelle Lauter in a little-known book called “Women As Mythmakers.” Topic of the book is poetry and visual art of 20th Century women, including discussion of female archetype and mythology. Some women discussed include Margaret Atwood, Diana Wakoski, Kathe Kollwitz, Remedies Varo, Lenonor Fini, and Anne Sexton. Some themes: Are women’s visions from collective history or current intuition? The gaps between language and reality, are they different for women than for men. And much more. I cannot praise this book highly enough. And, amazingly (but perhaps in keeping with the “silencing” of women) unknown, and out of print. Her fatal error? Isolating herself (Lauter references in comparison someone like Mary Daly, who is better able to integrate her absolutely “out of the paradigm” search for a new “god”) Instead, Sexton stopped taking her medication and cut herself off with her visions until they destroyed her. Some of this resonates so strongly with me, in the sense of not being able to even visualize myself as a “creative artist” for much of my early life, then ending up at 40, feeling mentally suffocated in a cramped but demanding job as a federal government auditor. I broke out in a rather messy way, but not at any permanent cost to life or health, thank goodness! This takes me back to the time when I read this book, many years ago now. If truth be told, I was probably too young and inexperienced at the time to fully appreciate its subtleties, so it’s interesting to revisit it now by way of your review. That voice is very striking, isn’t it? So distinctive. How’s this for that ‘girlish’ voice; this is near the end of the novel, when one of her neighbours in the psy institution, Joan, has shockingly succeeded in killing herself and Esther braces herself to attend the funeral: ‘There would be a black,six-foot-deep gap hacked in the hard ground [it’s been snowing]. That shadow would marry this shadow, and the peculiar, yellowish soil of our locality seal the wound in the whiteness, and yet another snowfall erace the traces of newness in Joan’s grave.’ Clearly shows the ingenue voice I quoted from the early parts of the novel was just that: a voice of a person not yet completed. A new take on that ‘falls the shadow’ extract I quoted in the post. Didn’t have the space to show how the voice develops so subtly, with such…i don’t know, dignity. I hesitate to say it, Jacqui, but this is probably one for revisiting. Won’t take long to reread…honest. Excellent post Simon, and a good point about resisting seeing the book as just autobiography which is too simplistic. I think the reader’s response to the book definitely changes with age and experience, but whenever you read it, it’s remarkably powerful. I was just glad that when I revisited it, it knocked me out as much as first time round. It had a powerful punch for me too, Karen. The raw honesty of the narrative is astonishing. I wish I’d read it when I was the age she was when she wrote it – but maybe not. It all fits in. Very interesting take on the book. I found it interesting to read in her letters (not the ones recently published, this was a book that came out around 1980) how carefully planned it was: she knew, I think, that people would take it as the autobiographical ramblings of a young woman, and she was quite calculating about it. As you say, it is faux-naïve. But it is a very powerful piece of work, and most certainly still speaks to young women (not only of course) today. With some nice clothes and accessories! Moira- I have a copy of Letters Home ( if that’s the one you mean): must look up what you mention. And yes, I did notice the clothes references! Thankjs for stopping by my Blog Simon. I have been reading some of your posts and both your taste in books and your writing about them is impressive. I have been meaning to read The Bell Jar for some time. As you describe it here, this sounds like such a great character study. The passages that you quoted are very impressive too. Excellent Simon. I’ve read this at least three times over the years and never cease to be impressed by it. The fact it’s suitable for teaching in schools doesn’t remotely mean it’s not serious literature. For me it’s a hugely well written and powerful book. The two scenes that always stick with me (other than that wonderful opening line) is the awful sequence where she loses her virginity and the ECT episode you mention. It’s a book that stays with you. As for “girlish”, I honestly think that says much more about some male critics than it does about Plath’s writing, not least because as you note that voice changes over the course of the book. Thanks, Max. There are so many memorable scenes – those in the first half like a sort of campus novel/young woman in big city, those in the second like a descent into a lower circle of hell. Was there anything SP couldn’t do in terms of writing if she put her mind to it? !